Primary squamous cell carcinoma of the breast (PSCCB) is an extremely rare breast tumor lacking hormone receptors and HER2 expression. However, in comparison with triple-negative invasive ductal carcinoma (TN-IDC), little is known about the PSCCB. Twenty-nine patients with PSCCB in Sun Yat-sen University Cancer Center from 1995 to 2010 were recruited in this study, along with 681 cases of TN-IDC during the same period. The clinicopathologic features and prognosis of PSCCB compared to TN-IDC were assessed. Furthermore, biomarkers of EGFR, CK5/6, E-cadherin, VEGF, TOPII, and p53 were immunostained to investigate the prognostic determinant of PSCCB. Patients with PSCCB were older than those with TN-IDC (P = 0.009) and presented with lower lymph node involvement (P = 0.015). There was no difference in overall survival (OS) between PSCCB and TN-IDC. However, the disease-free survival (DFS) of PSCCB was poorer than that of TN-IDC (P = 0.007). Multivariate analysis revealed that combined over-expression of EGFR and CK5/6 was the only independent prognostic factor for OS of PSCCB (HR 6.08, 95 % CI 1.33–27.85, P = 0.020) and associated with lymphatic metastasis (P = 0.023) and p53 expression (P = 0.013). Other predictors for poorer OS and DFS were lymphatic metastasis and stage III, which failed to show significance after multivariate analysis. 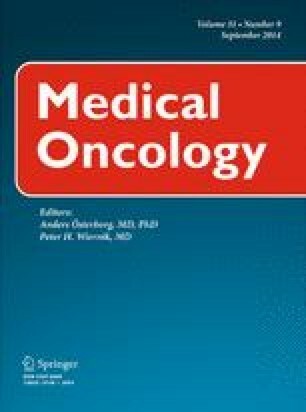 Furthermore, platinum-based chemotherapy was identified to improve the OS of PSCCB with EGFR + CK5/6+ (P = 0.027). The prognosis of PSCCB is poorer than that of TN-IDC. As the only independent prognostic factor for PSCCB, combined over-expression of EGFR and CK5/6 might be a potential indicator for the use of platinum-based chemotherapy. We would like to thank the patients that participated in this study. We would also like to thank the Guangdong Medical Association and National Natural Science Fund Committee for the funding which supported this project. This study is supported by the Medical Scientific Research Foundation of Guangdong Province (B2013143) and National Natural Science Foundation of China (31100935).